Alaska is home to endless natural splendors, from its majestic mountains to countless species of wildlife. When ranking the 49th state’s resources by tastiness, few things can compete with wild-caught salmon for the top spot; and few fisheries can match the caliber of the Copper River. Quality, sustainability and passion are just some of the reasons Copper River Seafoods is considered the ultimate when it comes to harvesting the bounty of Alaska’s waters. Princess is fortunate to partner with Copper River Seafoods in bringing wild-caught salmon from the chilly waters near Cordova, Alaska, to your plate within 24 hours. And it isn’t just by chance that some of the world’s most delicious salmon emerges from Alaska’s Copper River. Scott Blake, president and CEO of Copper River Seafoods, is a fourth generation fisherman and has a deep understanding of the special salmon that inhabit the waters near Copper River. From our easternmost Princess Alaska Lodge at Copper River to our northernmost lodge in Fairbanks, we take great care in developing and offering our guests a variety of delicious salmon dishes that feature an ideal mix of the fish’s natural flavors and complimentary seasonings. Whether your visit to Alaska features exploration of Denali National Park with a stay at either Denali or McKinley Princess Wilderness Lodge, or you plan to visit our lodges in Fairbanks, Cooper Landing or Copper Center, you can count on fresh, world-class salmon dishes in our restaurants along with premium accommodations at Princess Lodges. But, we don’t simply want to tell you about the superior quality of seafood you’ll enjoy when you stay with Princess, we want to show you. 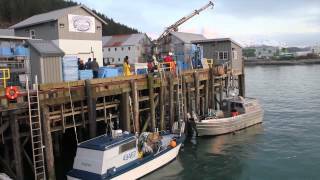 So watch this enlightening, entertaining video (above) from Philippe and Scott to learn more about the commitment Copper River Seafoods has to providing the best seafood in Alaska and how Princess proudly brings the fruits of this labor of love to its guests.